WooCommerce Quick View adds a ‘quick view’ button to product loops that show product details in a lightbox when clicked. Go to: WooCommerce > Settings > General. Quick View Button. Insert a quick view button to be appended to the product loop. 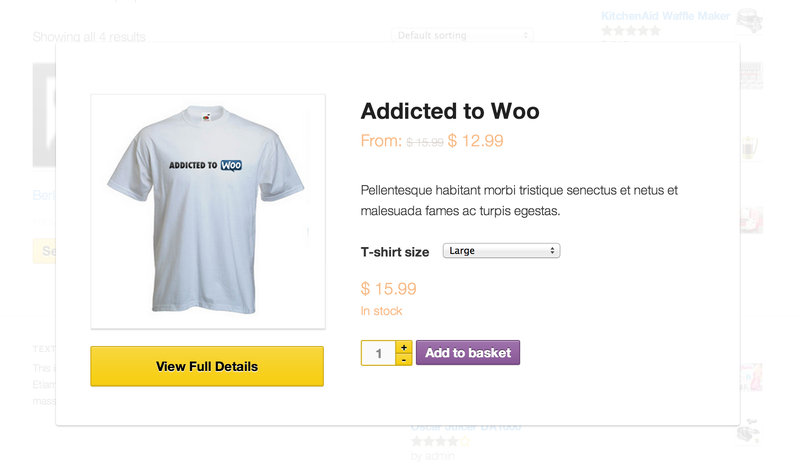 How do you know if a button is a ‘non-ajax add-to-cart button’? When you select a shop button, does it reload the page? If it does, that is a non-Ajax button, this excludes the add-to-cart button. Note: This is a Developer level section. If you are unfamiliar with code/templates and resolving potential conflicts, select a WooExpert or Developer for assistance. We are unable to provide support for customizations under our Support Policy. To customize the button, copy woocommerce-quick-view/templates/loop/quick-view-button.php to your theme: woocommerce-quick-view/loop/quick-view-button.php and edit the file. Alternatively, the button HTML is filtered through the woocommerce_loop_quick_view_button filter (modify output with http://codex.wordpress.org/Function_Reference/add_filter). To customize the product data shown in the modal, copy woocommerce-quick-view/templates/quick-view.phpto your theme: woocommerce-quick-view/quick-view.php and edit the file.